The ideal gift for lovers and connoisseurs alike, offering all the savoir-faire of Peugeot mills in this exclusive gift box, combining aesthetic audacity and the ingenuity of high-precision mechanisms. The mills presentation box offers the quintessence of the very best of Peugeot. 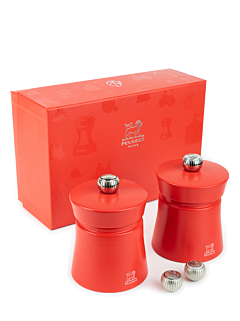 Pepper mills, salt mills, spice mills and coffee grinders, both manual and electric... are available in exclusive collections that enhance ingredients and produce a perfect grind, a fragrant flavour, and particularly intense aromas and enhance all types of cuisine with a combination of practicality and aesthetics.